Duncan has been involved in fund raising activities for local youth through sport. 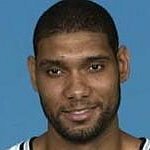 In 2001 he created the Tim Duncan foundation to better support non profit organisations dedicated to youth programs, health and research. Google trends for "Tim Duncan"
We don't have any videos related to Tim Duncan.